First kisses, more revelations and the beginning of the deaths. Cover: While this cover is incredibly crowded it does reflect just how complex the series has gotten up to this point and just how many sub-plots are going with every Sailor Soldier carrying a part of the story. Having Jupiter as the main focus was a good choice as the character gets the most development on this volume. Well designed with some nice images chosen for the rear as well. The Menus: Having no idea which character would be the focus of the menu this time around ("Haven't they all had a go by now?") I kind of expected a group shot but much to my surprise we get a Princess Sailor Moon themed disk this time that makes complete sense considering how much plot revolves around her at this point in the series. 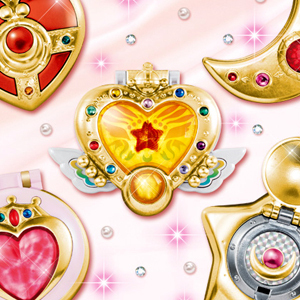 The only problem I can find with the menu is the picture chosen seems to have Sailor Moon in Princess Sailor Moon's costume. Princess Sailor Moon is never that happy in the series. A much more kick arse pose would have been more appropriate than the one chosen which is a little off-putting for those who have actually seen the series. The Special Features: Here we have the third group round table discussion that continues from the previous one where they were talking about which male cast members they think are the sexiest. The conversation changes to cover getting to and from the studio and locations for filming on the Japanese train system (not easy!) and the revelation that they had to sleep at the studios several times as they would finish filming so late and would have to start the next day at an early time there was no time to go home and rest! 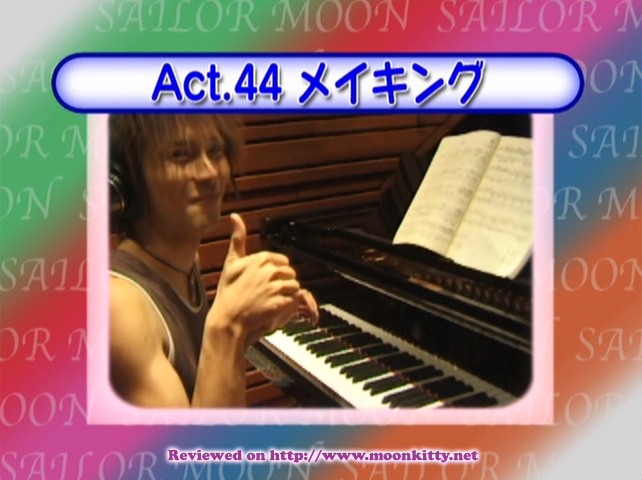 As well as the usual deleted scenes are some great behind the scenes footage of Endou Yoshito (Zoicite) recording the piano music for his scenes as Zoicite. It's a nice edition and adds a lot to the piano scenes in the series knowing the actor is actually playing the piano in them. Takamaru Masataka returns again and talks about how the kissing scene in Act 43 wasn't in the original script but they decided to do it due to the great lighting when the shoot was taking place as well as a manga style sketch one of the staff had drawn on the script page of Mamoru and Usagi looking at each other with Beryl in the background. The Episodes: Act 41 is one of those episodes that everyone needs to see. 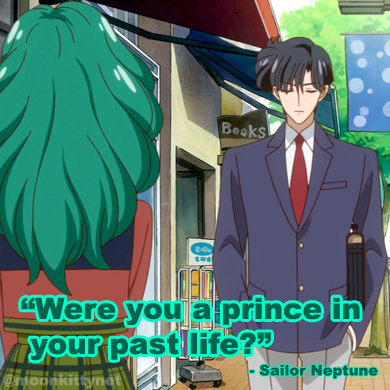 Usagi and Makoto reveal their Sailor Soldier identities to Naru and Motoki while Ami gets (maybe?) a love interest and Usagi continues to deal with the reality that she has the power to destroy the world. 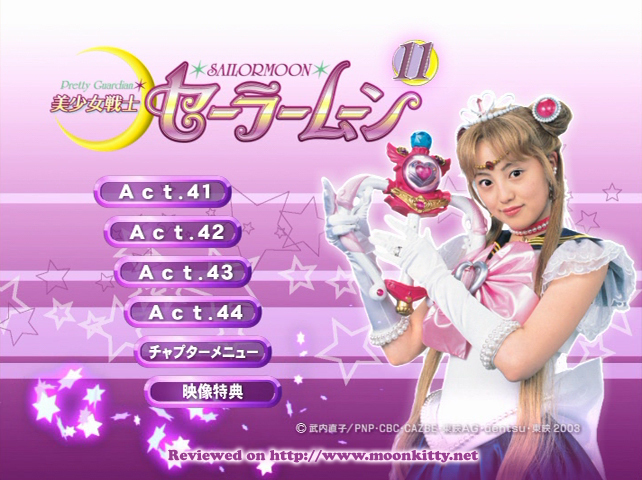 Act 42 continues to deal with the threat that is the Moon Princess while offering some down time for most of the characters while the plot focuses on the fight from Mamoru's point of view. More secrets are revealed (hilariously) when Shingo sees Luna not only walking and talking in her cat form but transform into her human form right in front of him! Act 43 is probably one of the most heartbreaking episodes in the series as Mamoru is given until sunset to spend his last day with Usagi and also partake in their first kiss (in this lifetime). A beautiful, well acted and haunting episode. Act 44 begins the deaths as we head towards the series finale. A major character dies and a surprising bit of information is revealed about Sailor Venus that will have you rethinking what you've seen in previous episodes.